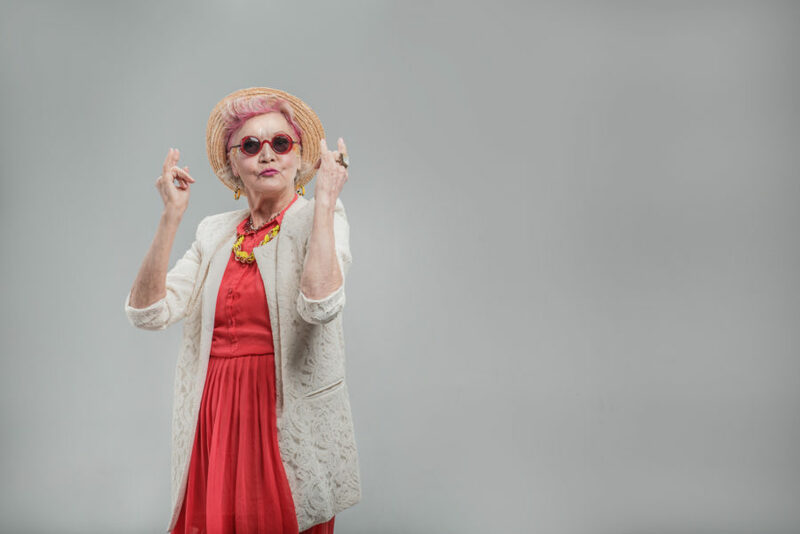 Certain milestone ages can have a negative impact on your confidence, particularly in how you dress. The fear of getting it ‘wrong’ and dressing ‘inappropriately’ often means putting together outfits that have the effect of making you look and feel older than your years. I remember my lovely Grandma hitting 60 and wearing head to toe beige. Every day. For some women, this change in the way they dress starts as early as 40. It’s not always a ‘beige’ thing, but they start to disappear behind very dull and plain clothes. Dressing in this way can make you feel invisible. And that makes me sad. It doesn’t need to be this way. A wonderful lady that came to my style masterclass earlier this year shared that she was there to learn about her own style because she didn’t want to go quietly into middle age! Wouldn’t it be wonderful if more women took this approach?! I’ve written today’s blog post to give you some pointers, inspiration and ideas to stay stylish, whatever your age. (Or to start feeling stylish if you feel you’ve never quite got to grips with owning your own style). Read on for my top 3 tips for creating interesting and exciting outfits. I’d love you to share your own ideas in the comments. How do you keep things interesting? Use a pop of colour in your outfit rather than trying to match everything up (or stumbling into the ‘beige’ zone). One piece, either an accessory or one item of clothing in a bold colour has much more of a stylish effect than several pieces worn in a matchy-matchy way. This is an image from Marks &Spencer’s website from the ‘inspire me’ section. The editorial is about how it’s time to switch out your straw bag for something more hard-wearing as we move into September. This is a great example of how to use a pop of colour in an outfit. The only pieces that match colour-wise are the trainers and the shirt, and they are neutral in colour, but it works. Brilliantly. Try mixing casual and smarter pieces together. This is easier when you understand your own style mix (click here to read more about how to determine your true style). A blazer doesn’t always need to be worn with tailored trousers and court shoes. They look great over jeans and more casual shoes. Don’t be afraid of accessories. Costume jewellery is a great way to add interest, personalise a look and change the way you style everyday pieces. Look for pieces that are eye-catching and that speak to you. I often find that women are instinctively drawn to the right styles but then talk themselves out of them opting for something ‘safer’ (read, boring). Avoid matching jewellery sets which can tip the look over into contrived and old-fashioned very easily. Mix things up and don’t over-accessorise! I hope these quick tips have inspired you to shake things up a bit. I’d love to know what you are going to try out and of course, please share your own tips for keeping your outfits youthful over in the comments. It’s always great to hear from you. I probably take it for granted that I do this naturally. I see so many women make the mistakes you have stated. Following your tips can take years off!